Located on the north west coast, Ao Suan Yai and Ao Pra Beach are two of Koh Mak’s best beaches – long stretches of pristine white powder sand and beautiful clear blue waters. The area is home to a small selection of boutique resorts as well as more mid-range bungalows, a cafe, bar and dive shop. Ao Suan Yai Beach is also the arrival and departure point for some speedboats from the mainland and other islands. The tiny islands of Koh Kham and Koh Pii lie offshore. There are just four resorts on Ao Suan Yai Beach, Koh Mak Resort and Seavana Resort, which stretch along the southern half of the beach, the much smaller Pompak Dee, which lies just to the north of the pier and Happy Days, constructed entirely from coconut wood, further up the sand. Golden Beach Camping has pitched a few tents too as another option. The wooden pier at the centre of the beach is used by Panan Speedboats coming from the mainland and Bang Bao Boats speedboat and its slower wooden boat, which shuttle between Koh Chang, Koh Wai and Koh Kood. By the pier, I Talay offers food and drinks, a nice spot for sunsets, while Pineapple Cafe, coffee and cakes, nestles in the trees just behind. BB Divers also have an office here, with their other branch in Ao Kao Beach. For tickets and tourist information, try Koh Mak Information Point behind I Talay. Continuing north along the sand, after the popular hang-out at Sabay Bar in front of Pompak Dee, you reach Happy Days. Next door, sits the oldest house on Koh Mak, a renovated wooden two storey clapboard affair, built around 1911 by the family of Luang Prompakdee, whose descendants still own much of the island today. At the far end, it is possible to pick up a signed track that takes you inland through the coconut trees, where after some hunting around, you can stumble out at Turtle Beach (Ao Tao Kai), a small deserted beach at the very northern tip of the island, well worth the effort. 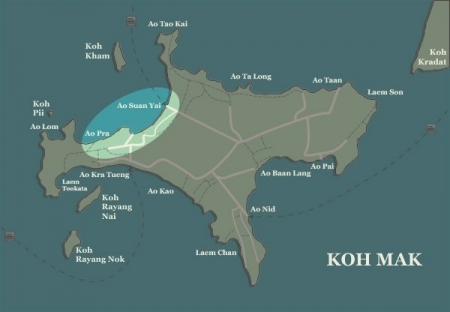 Offshore from Ao Suan Yai and within easy kayak distance, is the island of Koh Kham. Bought several years ago, it is now private and home to a partially built exclusive resort. The construction project has been on hold for several years due to an ongoing dispute, but for an entrance fee of 200bt, you can visit and there is a small shack selling drinks. If you don’t want to kayak, there is a 3 times daily boat across, with the return 3 hours later, 100bt – book at Koh Mak Information Point as above. 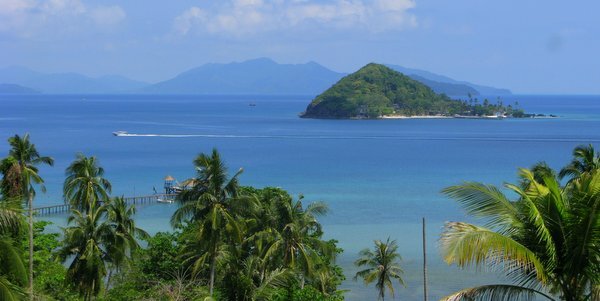 A narrow road which follows behind the bungalows of Koh Mak Resort and Seavana Resort leaves Ao Suan Yai from the southern end and after turning up a small slope, brings you out in the central section between it and Ao Kao Beach, the main beach on the south west coast. Good Time Resort and its various large villas and houses are on on the south side of the road, whilst on the northern side, Islanda Resort Hotel and Thaidaho Vista sit on the brow of the hill, overlooking the bay of Ao Suan Yai below. The views from these two resorts are simply spectacular, a wonderful sweeping panorama which takes in the north, Koh Kham offshore and the headland in the south. Just by Good Time Resort, the road drops down another steep hill to end at the back of Makathanee Resort, which is located at the northern end of Ao Kao. Ignoring this turn, the road leads on to the entrance to Cococape Resort, a sharp incline down to the sea and beyond that to Laem Tookata in the very south west of the island. Cococape Resort is located on the cape separating Ao Suan Yai Beach from the next bay along, Ao Pra Beach and you can walk one to the other in about 10 minutes or it’s an easy kayak too. Ao Pra Beach itself is a lovely long strand, now home to Mira Montra Resort, Koh Mak’s newest boutique resort. You can reach the resort by road off the same back road leading to Laem Tookata as outlined above. At the southern end of the bay lies the tiny uninhabited island of Koh Pii, a great spot for snorkeling, as indeed is the whole of this area. The main route away from Ao Suan Yai Beach, as opposed to the back route from the southern end, is found behind the pier by BB Divers. Just by its start, two roads lead off to the left, with the first giving access to Happy Days and the old house. A few metres in, you will also find the abandoned art garden, The Kingdom of Somchai. The artist was a former inhabitant of Koh Mak and you find his art scattered around and about the island, in particular above the pier at Ao Nid. Here, in the studio as it were, you can see first hand the eye wateringly graphic statues of women in various comprimising poses which was his metier. The second turning off the main road takes you along for a good few kilometres before hitting a dead-end, where you can drop down through the trees to join the north coast trails. Once past these side streets, the main road itself heads straight across the island towards the east coast and with a right turn at the crossroads, joins up with the section leading to Ao Nid in or continues onto the southern end of Ao Kao.